You'll notice there's no parent star in this concept art of recently discovered (and unsexily named) CFBDSIRJ2149. That's not a mistake. In fact, it was a very conscious decision on the part of the artist. Because CFBDSIRJ2149 has gone rogue. It's homeless. A wandering planet, it orbits no star — which could well make it astronomy's first confirmed "free-floating" planet. Similar rogue planet candidates have been detected in the past. Some of these subjects may have actually been rogue planets which formed in solar systems similar to ours, only to be flung from their host stars' orbits. Others may have been "failed stars," known more commonly as brown dwarfs. But these candidates are notoriously difficult to study, as nearby stars will often obscure astronomers' view. As a result, these subjects have managed to avoid the detailed analysis required to make an official judgement on their rogue planet status. Until now. Edit: To be clear, this is not the first potential rogue planet astronomers have ever seen. As Joe Hanson rightly points out, previous surveys have come across many such starless planet candidates. Most of those, however, have been difficult to study, and could even be regular planets that orbit so far from their host star that the latter goes undetected. "Looking for planets around their stars is akin to studying a firefly sitting one centimetre away from a distant, powerful car headlight," said Philippe Delorme, lead author of a study describing the errant celestial orb, in a statement released by the European Southern Observatory. "This nearby free-floating object offered the opportunity to study the firefly in detail without the dazzling lights of the car messing everything up." Delorme and his team discovered CFBDSIRJ2149 while scanning the night sky with the Canada France Hawaii Telescope on Hawaii's Mauna Kea and the Very Large Telescope (VLT) in Chile. Over the course of their investigations, the researchers observed hundreds of millions of stars and planets. CFBDSIRJ2149, alone, was found to be homeless. Pictured here is a closeup of the planet as seen through the eyes of the SOFI instrument on ESO's New Technology Telescope at the La Silla Observatory. It appears as a faint blue dot at the center of the image. Here's what we know about the newly identified cosmic vagabond: For starters, it's close. Located just 100 light years from Earth, it's the nearest free-floating planet candidate ever discovered. It's big (around 4—7 times the mass of Jupiter), but not too big. Objects more than 13 times the mass of our solar system's largest planet are considered to be not planets at all, but brown dwarfs. It has company; the planet appears to belong to a traveling band of celestial objects known as the AB Doradus Moving Group. It's also very cool. In visible light, the planet would be a dim, deep-red color. 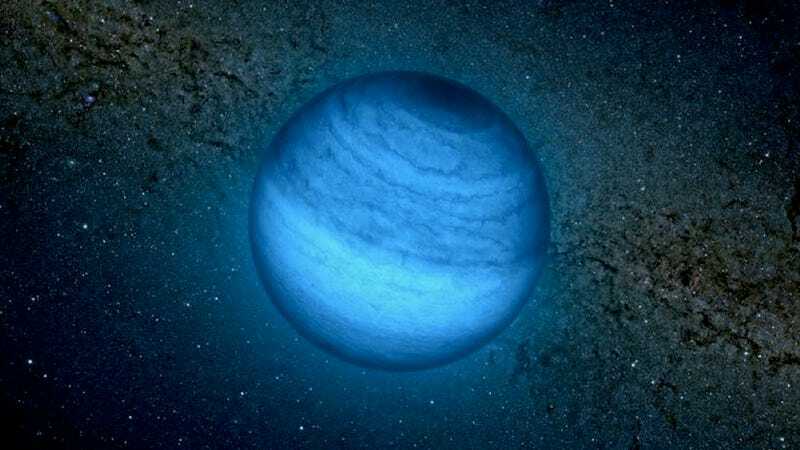 In the images seen here the planet appears blue, as light at longer IR wavelengths are thought to have been absorbed by molecules in the planet's atmosphere. Further work should confirm CFBDSIR2149 as a free-floating planet. This object could be used as a benchmark for understanding the physics of any similar exoplanets that are discovered by future special high-contrast imaging systems. Delorme's team's research will appear in Astronomy & Astrophysics on 14 November 2012. You can also access it free of charge over at arXiv.